The Shoot is proof you should never judge a book – or in this case, a rather innocuous-looking video game – by its cover. Essentially a guinea-pig for the PlayStation Move’s shooter credentials, it contains, much like the marvellous Sports Champions before it, the kind of clinical presentation that’s as casual as its perceived audience. Perhaps unsurprisingly then, many were quick to dismiss Cohort Studios’ gallery shooter, casting it aside with little more than a cursory acknowledgement. But if you are a casual gamer, and bought The Shoot expecting a cute tech demo for your motion controller, you may be surprised to find you have a bonafide game on your hands. The title plays on a double-meaning; shoot a movie, shoot a gun. There are five ‘movies’, each riffing on a different cinematic theme that includes a western, a sci-fi, a film-noir/gangster flick; an underwater fantasy and, of course, a haunted house horror. It’s hard to pin-point precisely why I’m so enamoured with The Shoot. Perhaps there’s the lingering buzz of being able to play lightgun-style games without having to dust off an old copy of Time Crisis, or venturing out to a seedy arcade to see if they’ve still got that partially-functioning version of Lethal Enforcers from the early nineties. With every scene comes a new, miniature burst of pure shoot ‘em up fun and the thrill of pointing the gun at the screen, waiting for the action to begin takes a while to subside. The manner in which The Shoot challenges the gamer is perhaps the most praiseworthy and surprising of its attributes. In many respects, The Shoot reveals itself to be more of a purists’ (or certainly, perfectionists’) blaster than either House of the Dead or Time Crisis. The reason? It specifically rewards not simply the player’s survival, but their aptitude and accuracy with a gun. The game’s great strength in this regard is that it caters for a broad range of gamers, in different ways. For less ardent players, five lives (or ‘takes’) makes for a gentle learning curve, allowing progress through scenes as The Shoot rarely bombards you with hails of bullets. Instead, the real art to scoring comes from stringing combo kills together without missing targets, as a designated score is required in order to progress to the next movie. For those less versed in this style of gameplay, it prompts multiple runs and the learning of levels, with real satisfaction being derived from improvements in both performance and score. The aiming is a smidgen slower than the player’s movements, meaning it’s important to follow the movement of the on-screen reticle, something that takes a few goes to adapt to. Elsewhere, it makes mostly very solid use of the Move motion controller. Occasionally, you’ll be prompted to lean one way or the other to dodge projectiles, which works smoothly, whilst there’s also a trio of special moves designed to aid scoring potential. ‘Showtime’ is the most common, a brief period of slow-motion activated by spinning on the spot; ‘Shockwave’ dispatches everything on screen when you shoot at the floor, whilst the awesome ‘Rampage’ turns everything sepia and grants a short period of rapid-fire mayhem, which tends to see send scores through the roof. All of these are hearty fun, although on occasions, these off-screen gestures cause the motion controller’s calibration to go a bit haywire. Sometimes during Showtimes if there are lots of targets close together, bullets fired in quick succession won’t always register as having hitting anything, ruining kill-chains in a frustrating and rather needless manner. The Shoot is home to an extensive, generous trove of content, far more than you’d expect of an early Move title. Remember the days when arcade shooters would have half a dozen levels and that was your lot? The Shoot goes a lot further, offering a whopping twenty – four for each of its five movies. The themes are mostly recognisable motifs but offer enough variety and charm to be replayed plentifully. ‘Outlawed’ opens things in the Wild West and is the most accessible, enjoyable setting due to the slow enemies and abundance of explosive barrels to hit. There’s little to criticise about the levels, save for a slight imbalance in the difficulty. ‘Robotomus Crime’, the second movie, is tricky because the majority of the enemy robots need to be killed with a headshot making it genuinely tricky to build combos, and it took me two or three run-throughs before I accrued enough points to unlock the next level. Conversely, fourth movie ‘Deep Perils’ was a far more sedate, less difficult adventure to conquer. Bright, chunky levels and cut-out enemies mean it’s more ‘carnival’ than ‘action movie’, and The Shoot does succumb to frame-rate dips now and again. 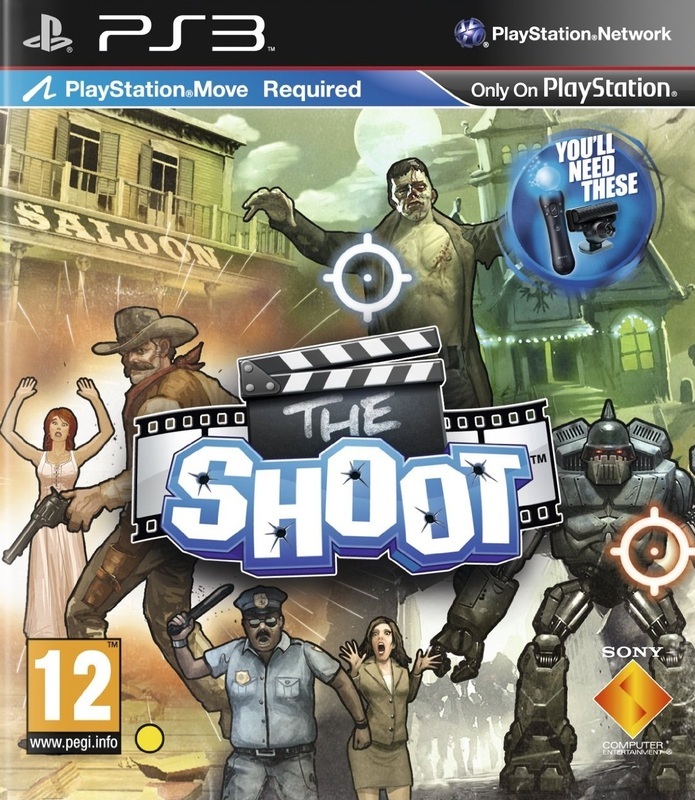 To some, the idea of shooting gallery targets will seem a touch cheap and sedate, but Cohort Studios deserve credit for creating a lightgun game that is inclusive to all levels experience, recognising that there are gamers out there who remember the quick bursts of fun similar nineties arcade games offered, and want something lighter than the usual full-on bloodbaths that dominate the genre. Before long, you’ll be hooked on improving high-scores, as much of a pleasure as anything else, and what the spirit of arcade gaming is about. The Score Attack mode allows you to tackle the twenty scenes in isolation, handing out star-grades based on performance, and by posting your top scores online, ensures yet more time-sapping ventures into adding a few more points to your best. The two-player mode doesn’t really fit the nature of the game’s scoring system, as you inevitably end up trying to shoot the same foes at the cost of combo opportunities, so perhaps the scoring should have been adapted for co-op. It’s a minor disappointment that there aren’t any online multiplayer options, though the same troubles would likely have marred it all the same. Substantial enough in terms of content and high-score opportunities to entice shoot ‘em up fans, whilst accessible enough to encourage less experienced players, The Shoot is a rare example of a game that caters well for players right across the spectrum. It’s not the prettiest, nor is it graced with the high-end budget of the films it knowingly parodies, but whilst it isn’t going to wow people into buying Sony’s motion controller on its own, it’s a must-play for anyone who already has one, with plenty of enjoyment to be found at a very reasonable price. "With every scene comes a new, miniaturised burst of shoot 'em up fun, and the thrill of pointing the gun at the screen, waiting for the action to begin takes a while to subside"